There's tongue-in-cheek irony in J.C. Chandor's sophomore film "All Is Lost". His cast of one, Robert Redford, is a nameless man stranded in his decaying boat hundreds of miles out to sea near the Antarctic Ocean. He speaks six full sentences, almost all offscreen, in the entire film. That's three 140-character Twitter messages. Off-camera, Mr. Redford, 77, is as talkative as Mr. Chandor's debut film "Margin Call" is, if not more so. Both of Mr. Chandor's features are about high risk. Both are about crisis: one natural, the other man-made. "All Is Lost", a film of meditation, is an unabashedly cinematic experience. Mr. Chandor crafts a grand silent opera of chaos, calm and consequence. Mr. Redford, in a superb award-worthy turn, gives an assured performance of thought, consideration and ingenuity as a man in a journey of survival against stormy seas. 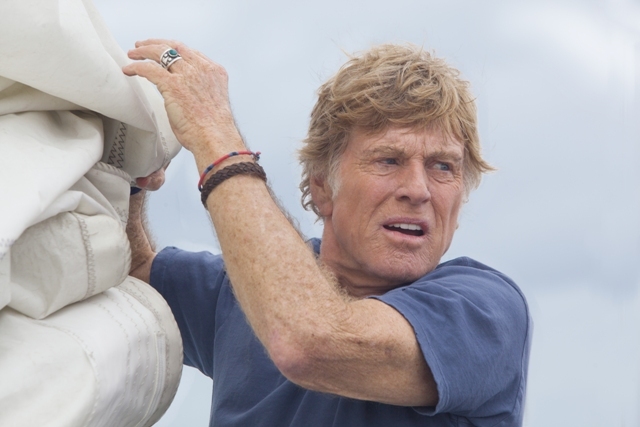 There's grace, guile and confidence in everything Mr. Redford does in "All Is Lost", to the point where Alex Ebert's music removed me from this immersive journey. We see despair, resilience, fear and adversity in Mr. Redford's eyes. We think about his plight as he does. We lose time. The soul of this character is the one thing we are allowed to know. The soul of the man permeates the movie from the start with words we hear from his diary entry, words that are a mantra, one he will rebel against to the end. That the unnamed character is severely tested is a tribute to the kind of heart and soul he has. Not speaking much may have been a challenge for Mr. Redford. Yet "All Is Lost" is the perfect calling card for an actor whose sensitivity, opinions and spiritual manifest is well-known. Survival is a primal instinct of any living species, and the onscreen environment surrounding Mr. Redford -- the very environment he champions and respects so deeply offscreen -- conspires against him. It seems, on the surface at least, a cruel joke. Mr. Chandor and Mr. Redford's intentions however, are sincere at all times. Mr. Redford's character tries to harmonize with the elements rather than fight them, even as he struggles for his very being in this existential drama. Cinema speaks loudest and most effectively when a director simply allows the medium to do what it does. Less is more. By not populating "All Is Lost" with distractions, extraneous plot and excess characters, by distilling the screen experience to its very essence -- expanse and intimacy, peace and turmoil, sound and silence -- Mr. Chandor achieves a beautiful, poetic and old-fashioned film. "All Is Lost" is a classic throwback in every sense of the word. "All Is Lost" is an intellectual action film, one where material possessions are replaced by adaptation and self-activation in the face of death. So many similar-themed films these days feature technology: cellphones whose batteries conveniently go dead in emergencies ("Buried") or are destroyed by a villain. What use are they, and why introduce them as a dramatic device if they will be squelched in a New York minute? Such is drama, I know, but rote, lazy drama. By contrast there's creativity and an instinct in Mr. Redford's onscreen maritime character that affirms the innate human know-how robots will never approximate. Mr. Redford's character, indistinguishable from the actor himself in many ways, has little more than a map as his guide. Mr. Chandor's film is foremost about endurance and the belief that the elements within people are stronger than the elements outside them. "All Is Lost" shows these competitive elements within and outside us and lets them wrestle on screen. The battle of endurance is physical but the will to survive is psychological, as films like "127 Hours", based on Aron Ralston's story, can attest. This year films like "Gravity" and "After Earth" have brought survival in isolated, unfamiliar and expansive terrain front and center, and while "All Is Lost" isn't the technical and visual marvel "Gravity" is, its storytelling and acting are better. There's only one scene that should have been eliminated from "All Is Lost". After seeing it you will likely know which scene I'm referring to. As I watched the film though, I thought: aren't human beings on Earth a futile, meaningless presence against nature? I recall Danny Glover's character Simon, who spoke of Lawrence Kasdan's film's title subject 22 years ago in "Grand Canyon": "Out here we don't mean diddly to those rocks." The same can be said of Mr. Redford's character on the raging seas of "All Is Lost". It's as if he's an intruder, unwelcome to the hostile waters, a man who doesn't belong in them despite his vast experience as a sailor and nautical navigator. An overhead shot and later sequence punctuate this idea: a man out of his element, and literally, out of his depth. "All Is Lost" demonstrates that when the end is nigh you still have your mind, breath and heart. You can affirm, as Nina Simone once did in a song, that "I've got life!" Mr. Redford gives his all in one of the great screen performances of his illustrious career. The film is a breathtaking spectacle: tense, ruminative, inspiring and harrowing all at once. There's no convenient models of masculinity ("The Perfect Storm") to salute. The Old Man And The Sea, or rather, The Old Man At Sea, may be what you have in mind as you watch Mr. Redford at work. It's survival of the oldest and wisest. "All Is Lost" is rated PG-13 by the Motion Picture Association Of America for brief strong language. The film's running time is one hour and 47 minutes.